November 24, 2014, 10:33 p.m.
Americans rely on online reviews to make purchase decisions but at the same time they do not trust that reviews are true and fair. The majority of Americans rely on online reviews. 78% check out the review section before making a purchase and nearly half of Americans (44%) are active contributors, actively writing reviews if only occasionally. Americans rely heavily on online review ratings and comments despite believing that many ratings are untrustworthy. Back in January 2014 we asked reviewers if they ever wrote reviews for products or services they had never actually purchased or tried. 21% said that they had – and the numbers of fraudulent reviewers has remained constant. 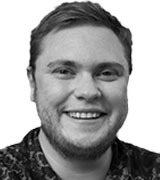 In this latest Omnibus survey we look in more depth at how people use reviews and why they are so important to the purchase decision process when so many know first hand that they are not always reliable. Those who admit to often writing reviews for products they have no experience of are men (11%) or millennials (13%). Although the over 55s do admit to ever writing fraudulent reviews, only 3% claim to do it often. If you want to trust a reviewer then try to find one from the Midwest – they admit to significantly fewer fraudulent reviews than those from the Northeast and South. Despite the rampant fraudulence, reviews are a really important element of the decision making process when buying products and services. Overall 87% of Americans who read any online reviews find reviewer star ratings important, and 34% find them very important as an aid to decision making. Slightly more Americans find the written reviews to be important (90%) with 41% finding them very important. 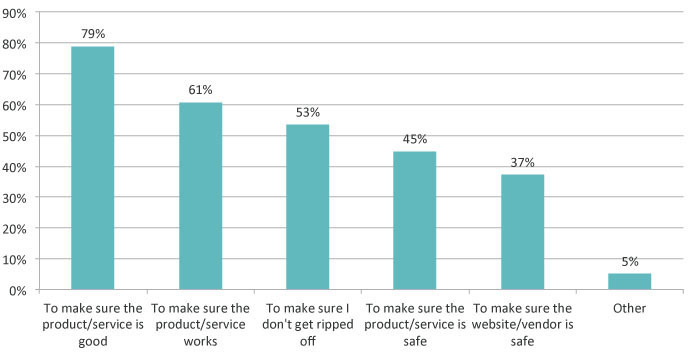 The main reasons given for using reviews are to ensure the product or service is of good quality (79%), that it works (61%) and to make sure that the purchaser doesn’t get ripped off (53%). Why do people read online reviews? People read a lot of reviews before making their final purchase decision. While 16% only read one or two reviews, half of Americans who read online reviews (52%) read four or more reviews before they feel they have enough information to purchase a product or service. 77% try to read an equal number of positive and negative opinions. Ticket price doesn’t dictate how often you use online reviews – although one in five (19%) only use online reviews for products over $100 a similar number (19%) use reviews for purchases of less than $10. • 89% believe that businesses write negative reviews of competitors. 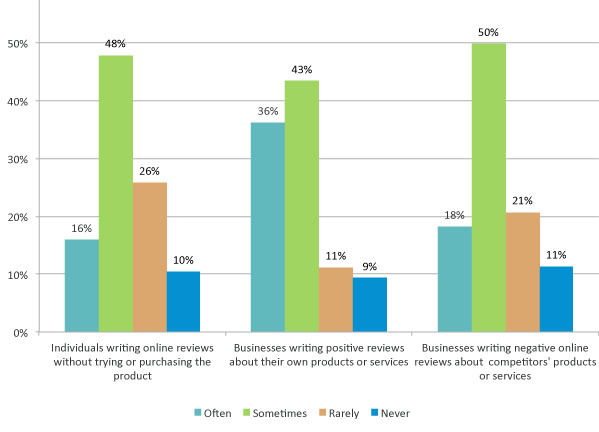 • 91% believe businesses write their own positive reviews (36% believe that this happens often). • Only 13% believe online reviews are very trustworthy. How often, if at all, do you think the following practices occur in online reviews? Although some people will knock out a review in under a minute, the majority of reviewers (45%) spend between one and five minutes to write their post, and a third of reviewers (35%) take more than five minutes. American reviewers generally write positive (74%) or neutral (32%) reviews, motivated to help others make better purchasing decisions (62%), or because they think it is polite to leave feedback (35%). Around a quarter want to share positive experiences (27%) and to help good vendors get business (25%). Only 12% are trying to expose poor vendors. Why do people write online reviews? The most read reviews are for Electronics (53%), household appliances (43%), car purchases (40%) and then hotels or short-term room rentals (36%). For further information about Omnibus results, and for details about methodology and Omnibus services, please email omnibus.us@yougov.com.